CITIZENS OF HEARTHPWN! RAISE YOUR EYES TO THE SKIES AND OBSERVE! this card seems pretty cool, can't wait to see if it works in a tempo mage. I think it's too slow to see a lot of play at high levels, but I love the synergy with Archmage Antonidas. Dat flavor text though.BEST PUN EVER! Maybe it works with Gazlowe, but then again mechmage is aggressive not control. It also has to die. . . So you either have a 7/7 or board clear. GG-eazy. Actually no, it's a Deathwing with -5 attack and -5 health, with a deathrattle instead of battlecry that doesn't discard your hand and it's a human instead of a dragon. Yeah the post is ironic because stupid comparisons makes no sense. i don't think gazlowe'll be included. 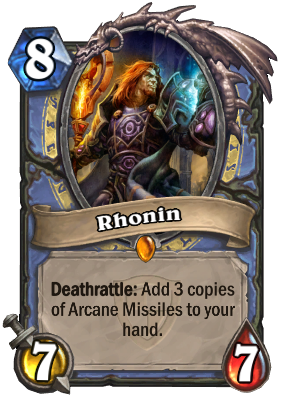 He is not part of mech mage decks even now, where there are a lot of spare parts. Just let Gazlowe rest peacefully in his grave plz. 1 at least. But even then, they are "wasting" it to remove 3 Arcane Missile draws. So many people are like "The fact that it's a deathrattle is terrible" and I'm sitting here going "in what world is that terrible." It's a 7/7, which means it's in BGH range. But you don't want to just BGH it, so you'd want to silence it, but even if you do it's a 7/7 body. Which means the only way to really "deal" with this card is to use two cards to specifically target removal it from the game. Even assuming someone has both of these cards in hand ready to go, the fact that they would need to use two potent effects on a single monster would make it 100% worth it.